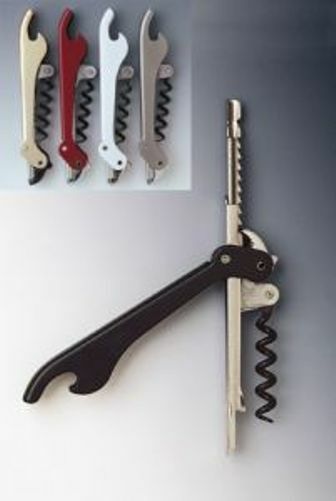 The Puigpull corkscrew is the only uncorking machine you can put in your pocket!! The new & revolutionary Puigpull corkscrew works like a car jack. You ease out the cork by actually ratchetting it out slowly. Because it pulls up at a 90 degree perpendicular angle, it is almost impossible to crack the top of the wine bottle neck. No more broken corks or cracked bottle necks! This corkpuller is acknowledged to be one of the best designed corkscrews on the market. Comes with built-in foilcutter. Lots of modern wines are screwtop, but what happens when you get one with a cork ? You’ll need The PuigPull Carjack opener – the coolest, most effective small corkscrew ever. It doesn’t strain your hands. Many waitstaff servers love the puigpull corkscrew because it is so different from any other opener. Not only is it unique, but it is actually quite a crowd pleaser. Waiters always receive larger tips because if the awe factor as one jacks out the cork from the bottle in an almost seamless manner. Insert the spiral worm into the cork, but do not twist it all the way down. Leave 1-1/2 spirals. Position the opener vertically. Then ratchet up the handle to lift out the cork. Just like a carjack. The puigpull corkscrew opener was invented by Spaniard Ramon Brucart Puig (pron.’pweeg’). It has a teflon coated screw and is hand produced by the family company near Barcelona. Imprintable too. Wine Accessories unlimited carries the full line of puigpull corkscrews including the very rare gold color and gold plates models. WE also offer overstocked logo printed closeouts at DISCOUNTS OVER 40% OFF our already low low prices.